SF BART is once again, giving a platform to white supremacists. 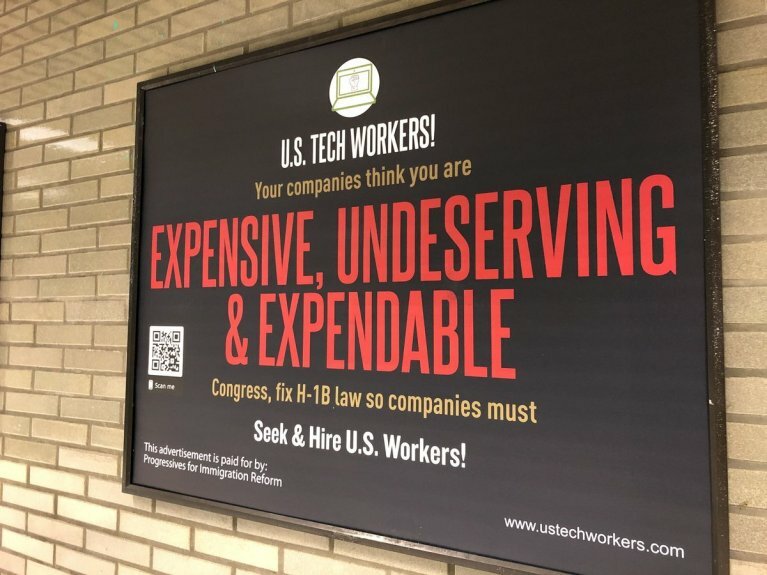 An organization that calls itself Progressives for Immigration Reform (PFIR), has placed posters at various BART stations, aimed at getting U.S. tech workers to scapegoat their fellow legal immigrant workers here on the H-1B program. Don’t be fooled by the name–PFIR is a solidly anti-immigrant hate group with ties to John Tanton, the white nationalist founder of the modern anti-immigrant movement. PFIR’s main goal has been to advocate for a reduction of all immigration, and solicit support from environmental groups by linking population growth through immigration to climate change. In the past year, PFIR has specifically turned their attention to the H-1B program to solicit support for their hate. What’s the H-1B law? It’s a federal immigration law that allows companies to hire temporary foreign workers for a three year period if they meet the requisite educational requirements. By law, companies are required to prove, through a publicly-available LCA filing, that the hiring of a temporary foreign worker will not displace any Americans vying for the position, and the person hired must be paid the prevailing wage for the position. Most persons who receive H-1B visas are of South Asian descent and around one-third of these visas go to companies in the state of California. By targeting the H-1B program, PFIR is trying to get disgruntled American tech workers to think that South Asian tech workers, and their companies are taking American jobs. Many persons have objected that the ads target immigrant workers who live, work and contribute positively to our community, but BART has refused to take down these ads even as they disparage entire portions of our community and run counter to providing a safe environment for all BART passengers. I have put up a community-drive petition to tell SF BART to take down these immigrant scapegoating and misleading posters. Please sign and share the petition. The Trump Administration is also taking its cues from the anti-immigrant PFIR in targeting legal immigrant workers. On March 20, the US Citizenship and Immigration Services (USCIS) announced that it has temporarily halted the premium processing facility for the H-1B visa, which allows applicants to fast-track the visa granting process. This change comes on the heels of other changes to the H-1B program, which is only making it harder for companies to recruit foreign workers, and consequently, prevents people of color from coming to the United States. If you want to do more to counter these and other white nationalist efforts, and have the means to do so, please consider donating to the Western States Center, and the Southern Poverty Law Center.